After playing out an intense 37-37 tie against Dabang Delhi K.C. 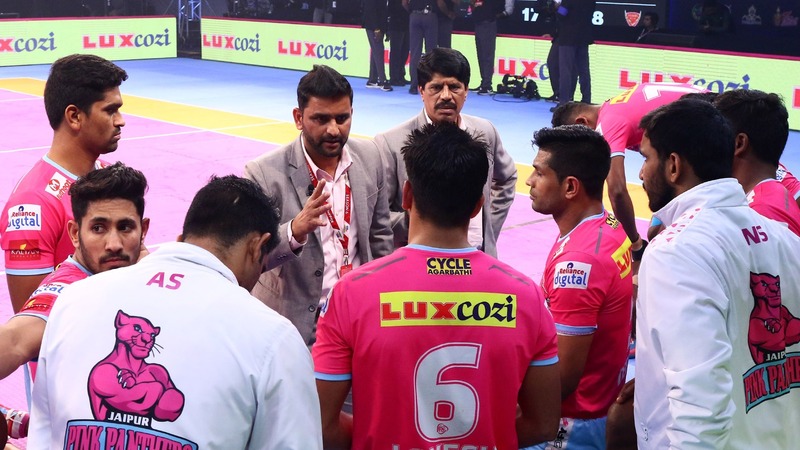 at the Tau Devilal Sports Complex in Panchkula, Jaipur Pink Panthers coach Srinivas Reddy and Deepak Niwas Hooda addressed the press conference to reflect on the game. Q. Coach, what do you have to say about this match? Srinivas Reddy: The match was tied but both the teams played a very good game, actually. There were plenty of situations that went their way and there were plenty that came in our favour. There were several turning points as well. When we were about to inflict an All Out, we got out and when we were about to get All Out they gave us points. There were a bit too many twists and turns. So, ultimately we ended in a draw. Q. The way Jaipur Pink Panthers played in the first half after being down, what was your thinking going into the second half? Srinivas Reddy: If you look at the home leg, our first halves generally haven't been that good. The lead has always been with the opposition so then we have to cover that and we either win the match or lose by a few points or end up as a draw. So this was a similar situation because we have a few young guys, and they aren't that experienced. But by playing on they will learn and mature. Q. How do you look back at the season? Q. Deepak, as a captain, who has been your standout performer in the team? Deepak Hooda: Ajinkya Pawar put on a very strong performance, whenever we needed. Selvamani K has also delivered often. Sandeep Dhull also has done well in the defence. Almost every player has done well. The team has performed very well and especially in the home leg.